I have a request for you guys. I have to submit samples of my work for a student gallery exhibition, and I would like to use a page or two from Selkie. But I can’t decide which ones1 I’d prefer something that can stahd on it’s own, and the newer the better (some of the artwork near the beginning is really… rough.) Any thoughts on a page that would be good for a gallery exhibition? I don't have anything special to say about this one, sorry. *o_o* … =_= … Yeah. Little kids, though they may not realize it, live by the law of the jungle. That means a lot of them are cruel and/or stupid. Aw, Heather’s bewildered, hurt expression… She’s always been popular, I think. Contrast it with Selkie’s “I hate this place” expression; our heroine does shocked and angry, but hurt requires an expectation that one will be treated differently. As to artwork for display, I think any of the dream sequence strips would shine, but especially the one with the dive from the dragon’s back. I love the last panel. Nicely done! An exhibition! That’s really exciting. I vote for this one because it’s my favorite. Or this one because the artwork is so pretty. I’d go with pages from the dream sequence. 611 has been mentioned, but I also like 616 or 639. Also, what happened to the “Go Wombats” banner on the school house? …Poor attention to detail on my part is what happened! Thanks! The new fan art is awesome. I vote for page 107 (https://selkiecomic.com/?p=517), because it shows off Selkie´s facial expressions. Also, this feels like it has the potential to be a long arc. I’m wondering things like “Will schools reflect modern changes to schooling?” Like will/does Selkie have paper books and recess still? Do schools not have books and recess anymore? It depends on the school. Some don’t; they’re moving toward eBooks and kindles and recess is going the way of the dodo in favor of more time doing test prep, thanks to No Child Left Behind. That being said, the schools I’ve worked in have always had paper books and recess, and that’s been within the last few years. There’s nothing wrong with you writing it as having those things; some people may make comments but no two school districts across the country are the same – and depending on funding, sometimes even schools within districts will vary widely. At my son’s elementary school, they did away with recess years ago. There’s a very short outdoors break after lunch if the kids don’t lose it for being “too loud” while they eat, but they almost always get it taken away. I’ve been there during lunch, and it really doesn’t take much for them to lose it. Yeah, I wasn’t so much saying it was a bad thing, I was just wondering what type of school she goes to, how that school is developed, and how much they do to protect Selkie, for better or worse. Then again, I’m the type of person who wonders if Selkie could get a blood-transfusion of she’s injured and how different she is on a biologic level from a normal “human”. Schools still have recess in elementary schools. Breaks and Lunch in Jr. High and High School. And they still have Hard Back books in Jr. High and High School. Despite the changing times.. lol. I hope they still have lunch in elementary school! I had recess up until I moved to Florida. We had no recess, the closest we got was PE class, which was always outside. In middle school and high school, our ‘breaks’ were only 5 minutes long. I moved to Texas and was shocked we got *le gasp* 8 minutes between classes. In every school I’ve been to, lunch has never been a break, really. Always closed campuses, and we weren’t even allowed to leave the cafeteria in elementary and middle school. Though I can’t argue with the sensory and tactile element you get with paper books as opposed to digital, as someone who is disabled, digital books are easier for me to use, read, hold, and manipulate. I think that would also be true for Selkie with her different physical traits and webbed hands – an ebook would be much easier on her than constant paper cuts on her webbing from handling books. As for a suggestion, sorry Dave, but I have enough trouble color coordinating my civilian clothes (uniforms are a no brainer). It’s not like she wanted to leave before she could talk to her friends. To be honest, if you’re going to submit anything, who could argue with https://selkiecomic.com/images/VomitFishandStars1024x768.png? Won’t people assume it’s a Jackson Pollock? As far as scenes that can stand alone, the introduction of Todd’s siblings. the backgrounds in that one are just as interesting and Dynamic as the characters, and its the one page that can one hundred percent stand on it’s own. my favorite part is the clock moves in “real time” showing a minute passing or so every time we see it. and the expression on her face in the last panel is perfect. They stopped being friends with her cause she got adopted first?! -rubs hands together- Somebody needs a good slappin’. Not for being adopted first. Keisha said earlier in the orphanage arc that she, Amanda and Heather promised they’d all get adopted at the same time by the same people so they could be sisters. That whole “we’d buy horses and race them to school every day” promise. We, the audience, have a bird’s eye view of what goes on, but the characters don’t. Look at it from Keisha’s and Amanda’s perspectives. In their eyes, Heather is a traitor because the three of them pinky swore they’d be adopted together. Not only did Heather get adopted alone, she left them without a word. Remember, they watched her leave while she didn’t even turn their way. they stopped being friends with her because she left without even telling them that she was going. So she did, and Amanda and Keisha were heartbroken and angry because she didn’t even tell them that she was going. Maybe 135 for your exhibition? It stands alone nicely and kind of captures the feel of the comic — normal, loving adoptive family…with a sea monster thing for the lovable little girl. I’m starting to feel bad for all of the characters, I’ve realized. Also, as others have mentions above, maybe a page from the dream sequence, either the first or the second one. 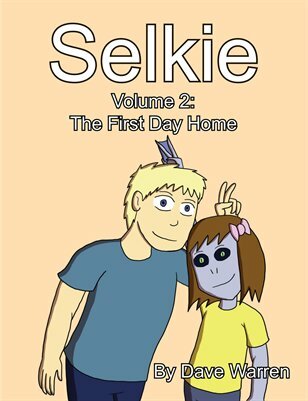 And I also suggest this one: https://selkiecomic.com/?p=586 Because of the different facial expressions, the shading, and the close-up. Even knowing how awful Amanda is. I think 54, 56, 122, and 123 would be great choices. If you have some Eva fans in the crowd then 110 could be fun. MAN that school is so huge! Look at that crowd! My elementary was friggin’ tiny compared to that. That size and number of kids woulda scared the crap outa me. Ugh, getting rid of recess so students will learn better? Most counterproductive idea ever.